The University of Denver Pioneers may have shocked the NCAA Division 1 hockey world last season by winning its eighth national title, but things will be much different when the 2017-18 campaign kicks off in October as a number of teams will be targeting the defending champs. Most of the college prognosticators have the Pioneers ranked as the top dog heading into the new campaign, but a number of programs are right on their heels including last year's Frozen Four semifinalist Notre Dame Fighting Irish, the Providence Friars and Boston University Terriers. And don't count out the Minnesota-Duluth Bulldogs who have revenge on their minds after dropping a hard-fought 3-2 decision to the Pioneers in the Frozen Four final in Chicago. There is a lot of hockey to be played and drama to unfold before the top four teams advance to the Excel Energy Center in Saint Paul, Minnesota for the 2018 national championships in April, but the Pioneers, despite losing some key cogs are as good a bet as any to be back in the mix. Replacing team leader and 2017 Hobey Baker Award winning defenceman Will Butcher will be a chore, but the Pioneers are looking to a pair of Canadians to offset that loss. Senior Tariq Hammond from Calgary, Alta., who has been named team captain, is a leader both on and off the ice and assistant captain and fellow senior Adam Plant from Penticton, B.C. was a co-winner of Denver's top defensive player award last season. Hammond appeared in 44 games last season, finishing third on the team with 54 blocked shots and was a plus 20. Plant played in 43 games in 2016-17, finishing with 13 points (3G, 10A) and was a plus 13. He also finished second in blocked shots with 80. Another key Canuck on the Pioneers roster is goaltender Tanner Jaillet. The Red Deer, Alta. native, who is entering his senior campaign as well, was the Mike Richter Award winner last season as the nation's top puckstopper. Jaillet started all but six games for the Pioneers in 2016-17, finishing with a record of 24-5-4 for the NCHC regular season champions. He led the conference in save percentage with .930, goals-against-average at 1.82 and tied for most wins with 24. His GAA ranked third in the nation and save percentage was fifth. In three seasons in Denver, Jaillet has appeared in 95 games and has a record of 59-18-9. With three 40-point forwards returning, including 2017 World Junior Championship star for the gold medal winning U.S. squad Troy Terry (22G, 23A), the Pioneers shouldn't have trouble putting up some good numbers. The other two are Henrik Borgstrom (22G, 21A) and Dylan Gambrell (13G, 29A). The other returning Pioneers from north of the border include sophomore forward Liam Finlay (Kelowna, B.C.) 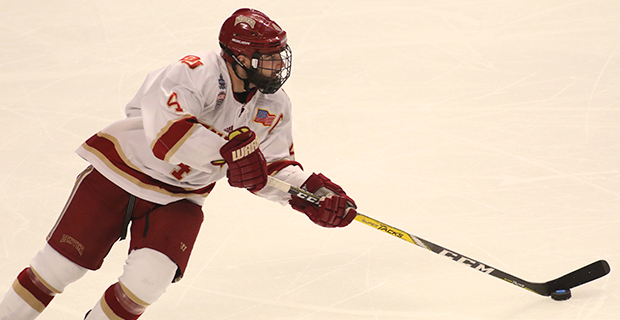 and junior forward Logan O'Connor (Calgary, Alta.). Four Canadians are also among the incoming freshman class. They are defenceman Ian Mitchell from Calahoo, Alta. (Spruce Grove Saints, AJHL), defenceman Griffin Mendel from Kelowna, B.C. (Penticton Vees, BCHL), forward Kohen Olischefski from Abbotsford, B.C. (Chilliwack Chiefs, BCHL) and forward Ryan Barrow from Banff, Alta. (Langley Rivermen, BCHL). The Pioneers will get their first game action on Oct. 1 when they play host to the Lethbridge Pronghorns of U SPORTS in an exhibition game. Denver begins defence of their national title with a pair of tough road games to open the 2017-18 regular season against Notre Dame on Oct. 13 and 14, followed by their home opener on Oct. 20 against Lake Superior State.